Complete your home theater with this gorgeous slate grey power home theater seating. With 3 individual reclining seats, you'll have a great spot for you and your friends. Each seat features lighted cupholders and floor lights, as well as power reclining mechanisms so you can recline at the touch of a button. It's well-tailored with clean lines. This gorgeous slate grey power home theater recliner is just what you need to complete your home theater. It features lighted cupholders and floor lights, as well as a power reclining mechanism so you can recline at the touch of a button. It's well-tailored with clean lines giving your home a refined style. Slate Gray 3 Piece Power Home Theater Seating - Nicholas is rated 5.0 out of 5 by 2. Rated 5 out of 5 by PamW Very comfy Love the color and quality. We've an open floor plan, so the backs of these chairs are the first thing you see when entering the 4oom and the look great! 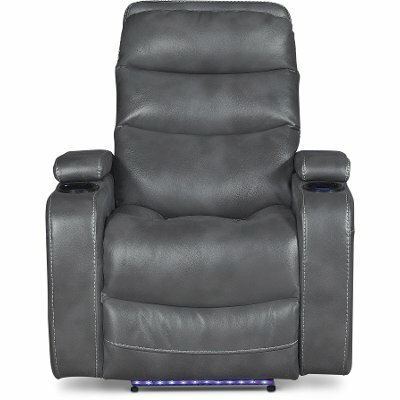 Rated 5 out of 5 by Fan500 This product is so comfortable We love our new power reclining chairs. We look forward to reclining in them and relaxing while we watch tv.